This is the updated version of HobbyBoss' -4 Corsair to make it into the later version. 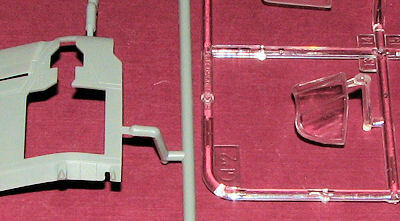 The first -4 (while sort of a mixture of variants) was the Monogram kit, complete with operating features. This was followed by what many considered the best -4 for decades, the Mania kit, soon to be in Hasegawa boxes as Hasegawa bought the company. Academy also produced a -4 Corsair, but it has been much maligned due to some basic shape errors. 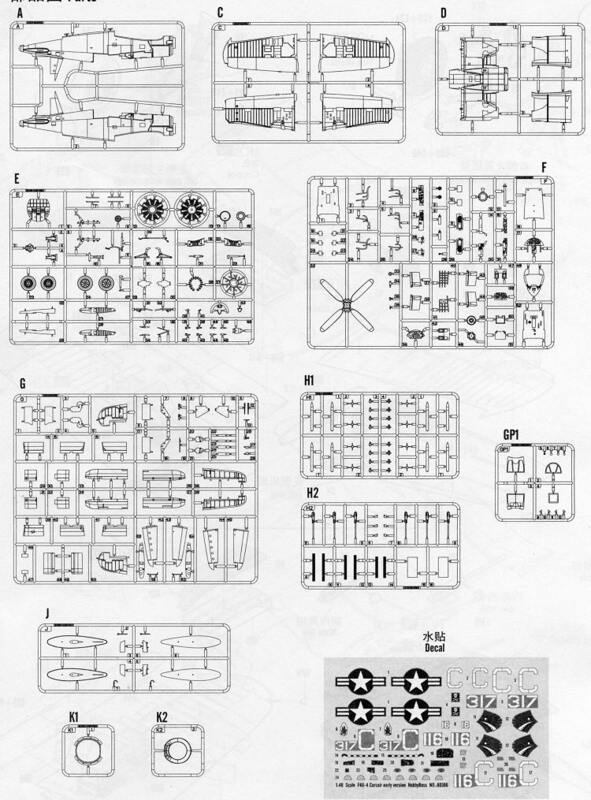 It is quite typical of new Hobby Boss kits with the usual engraved panel lines, individually bagged sprues with the fine parts protected. There is a nicely detailed interior that offers the option of decals for instruments. The engine is also well detailed and an accessory section is also provided. The wings can be folded if need be. Ailerons and flaps are separate pieces, though the instructions do not show the flaps being lowered, a common sight on parked planes. One also gets the opportunity to show off the open gun bays if so desired. For things under wings, there are two inner wing drop tanks and outer wing rocket stubs for four rockets. The stubs themselves are separate so you could model the plane without the rockets and still have the stubs showing, a common sight for those aircraft not going directly into action. A rather odd option is to have the tail hook lowered while on the ground. As a later version, this kit has a different canopy with a flat center section. This is correct for the type and the fuselage halves are different to accommodate this feature. The cowling is the same as on the earlier kit so that has not been altered. Fortunately, True Details provides a resin replacement that is closer to the real deal. I do not recall if ther e were comments on the small main gear door opening on this one or not, but I have included an image of this area as well as the new canopy for you to judge. Something that slipped past me when first looking over the parts is that the wings have clipped tips like for the British F4U-1s. This is certainly not correct for this version and you will either hope that Hobby Boss noticed and will provide replacements, or break out the epoxy putty or plastic card and made new ones of the right shape. It should be easy to do, but should not have to be done. Instructions are well drawn a nd offer a variety of paint company references. The full color markings guide provides for two overall gloss sea blue planes. 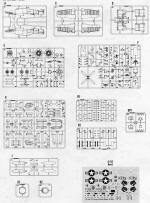 One is the box art aircraft from VMF-323 'Death Rattlers' in the same markings as their 1/32 kit. The other is from VMA-312 with the checkers on the side and lower cowling. 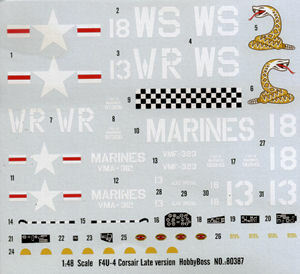 Decals are well printed and include instrument panel and side console decals as well as decals for the tail hook. These latter ones are in a right and left mode rather than the usual wrap around most other companies use. Personally, I would paint these as I cannot see how the decals would work successfully. For those wanting other markings, there have been aftermarket sheets in the past that cover this version. 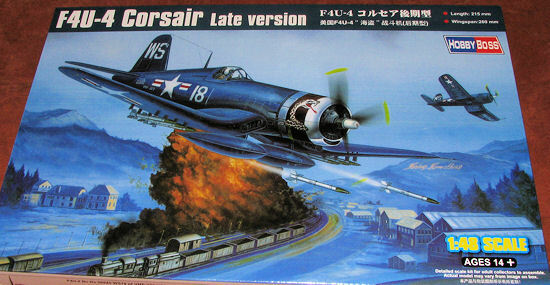 It is nice to see this kit released as I know Corsair fans have been waiting for the later version. As with the earlier version, it would be wise to have a photo of the plane you wish to model to ensure that it is the correct sub-variant. It is too bad about the wing tips, but again, they are relatively easily taken care of by using those modeling skills.